The world’s No. 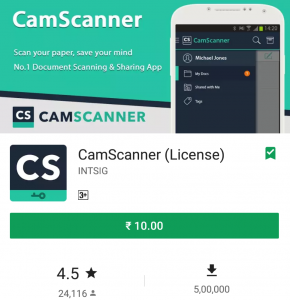 1 mobile document scanning and sharing app CamScanner (License) is now available for Rs 10 only (90% off). This is a steal deal and must have app, so without wasting your time grab this limited time deal. The world’s No. 1 mobile document scanning and sharing app with over 100 million installs in more than 200 countries and regions. Sign up to sync documents on the go. Just sign in to any smartphone, tablet or computer (visit www.camscanner.com) you own and you can view, edit and share any document. (Registrants only).